If you are on a self-hosted blog, chances are that you have already used the ‘Live Support’ features most webhosting companies provide. I think it’s a really cool feature. Much better that having to open a ticket and wait for someone to reply to the ticket. Using a liveSupport function instead of the ticket system shows that your company actually wants to be accessible at all times. It simply shows that you care. UZOOM is one company that provides all kinds of chat related softwares for your site/blog. First, we look at the ‘Live Chat’ feature. This service was very easy to setup and run. You just need to add the ‘LiveSupport’ button to your page that will show the ‘NOW ONLINE/OFFLINE’ status. The rest can be controlled from your account on their site itself. You can add additional operators so that your team can attend to different clients at the same time! Then there is the Free Chat Client that allows you to add a neat looking chat window to any page (you don’t need an account with them for that). Just pick a nickname and chat away. 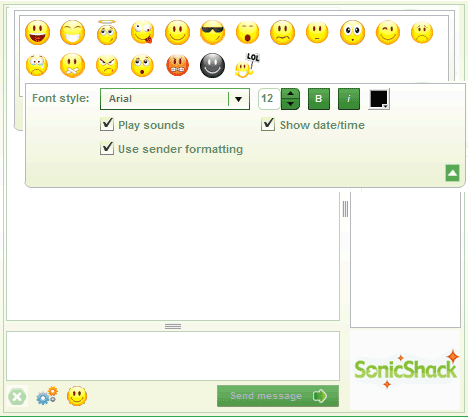 As seen in the screenshot below, it has all the standard messaging features like text formatting and emoticons. But now the big question – Do you really need a chat software as a blogger? A support system could come real handy if you are a designer who’s just released a theme or a new plugin. If you are a full-time blogger, why give away your private messenger IDs when you could chat off your own blog! Sounds like a great way to give back some of that reader love. Then you can always add it to your facebook/myspace page. LiveChat sometimes took ages in the ‘connecting servers’ phase. Note: I have implemented the chat client on my blog. Give it a shot. It can be found here. I have been looking for a good chat widget for my blog so that I can chat with a few friends and visitors when I am online. I haven't seen any that is light and easily customizable. I think I will have to try UZOOM to see if i get anything nice from them. Thanks for this.I searched internet for chat for my website and this one looks very promising.Will give it a try and let you know. I've been using this service for some time now. Really useful. Talk to your website visitors instantly in realtime. Recieve notifications via SMS of new chat/support requests. When someone visits your website and you or your support team are online they are presented with a button where they can talk.